I use the create 365 Happy Planner from Me and my big ideas. I have been using this planner since July 2017 and it really is the planner for me. I love having 3 sections per day. I divide them in different categories. Meetings / Things I have to remember, Tasks and the last section is actually for my baby boy, but I don’t have a lot to write in there, so I usually put some cute and motivational stickers there. My planner and some accessoires I’ve bought in the beginning of this year. 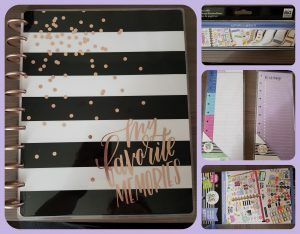 This is the planner I use now, it is my second planner from them. It really works for me, because I’ve been using them for almost one and a half year, most planners only stuck with me for about a month or two. And I’ve been better with accomplishing tasks since this planner.